AutoHotkey has no limits when it comes to automation in Windows, but for many users who may only need simple keyboard shortcuts, installing and learning AutoHotkey, and keeping up to date, can be overkill. ShortKeeper is a new lightweight software utility to help non-programmers create and maintain an AutoHotkey based system running a set of custom keyboard shortcuts. 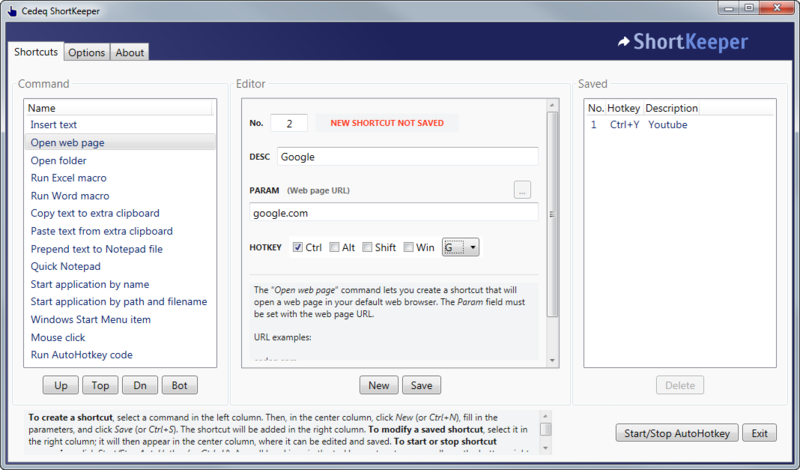 ShortKeeper provides basic commands to easily create shortcuts, without the need to learn AutoHotkey (e.g., open a folder/document, start an application, insert text, show a webpage, etc.). For those who want more versatility, a special command accepts AutoHotkey code to create shortcuts/macros (or to use pre-existing ones from the Internet) that can do pretty much anything. ShortKeeper can be set up in no time and requires no specialized knowledge (e.g., ASCII, ANSI, or Unicode, 32 or 64 bit, AHK script structure, etc.). It manages the whole AutoHotkey based system in a way most non-programmers will find to be remarkably efficient and effective. Its graphical user interface can be mastered quickly thanks to interactive help zones. ShortKeeper is free, portable, and digitally signed. It comes bundled with a version of AutoHotkey. Everything works from a single folder that can be easily moved or deleted. It is Windows 10, 7, and Vista compatible (with .NET 4 or later). Thank you. Well thought-out application. I think I can test the efficiency and leave a comment again. Thanks again. hasantr wrote: Thank you. Well thought-out application. I think I can test the efficiency and leave a comment again. Thanks again. You’re welcome. Any test you could do would be useful for the whole community. I am looking forward to your comment. -"Launch website" command now renamed "Open web page"
Last edited by enterpad on 24 May 2018, 19:08, edited 1 time in total. Extra Clipboard, He does not write the letter i. The properties are beautiful. If you develop more, you can pass alternatives. I will try to articulate between the programs I use all the time. I want to keep feedback. Thank you for your work. I imagine that you are using “Copy text to extra clipboard” or “Paste text from extra clipboard” to insert (instead of copy/paste) text. In the Param field for this command, you need to specify a clipboard number (e.g. 1, 2, 3, etc.). It should not contain the text you want to copy or paste. We will try to improve the help content. Please let me know if you still don’t understand how to use the clipboard commands. They are really useful. “Example of Param” (at the bottom of the center column) should have specified “Click, 300, 400” instead of just “300, 400”. The help content has been updated (ShortKeeper v1.0.1.9). Don’t miss the three-dot helper button (to the right of Param) to get the screen coordinates. Last edited by enterpad on 05 Oct 2018, 09:36, edited 1 time in total. Nice program. Though was a little surprised it is a .NET program and not itself written in AutoHotkey, as it would be possible. Thank you for your feedback. Yes, it would have been possible, but not the best way in my opinion.